Tacoma Art Museum (often abbreviated as TAM) is a fair-sized art museum located in downtown Tacoma and the largest area art museum outside of Seattle. It features ongoing exhibits as well as temporary ones that bring in such cool artists as Norman Rockwell and Dale Chihuly (who is also part of the permanent collection). TAM is also home to the Haub Family Collection of Western Art, the only collection of Western art in the Northwest. If you're at all a fan of art, TAM is a museum worth visiting. It's large enough to spend an hour or two wandering, but not so large that it's overwhelming. It's also in close proximity to a number of other museums, which makes it pretty unique in the Northwest overall where most cities have their museums spread out. Tacoma Art Museum has both exhibitions pulled from its permanent collection and temporary exhibitions. Something all visitors can always see are pieces from the TAM Chihuly collection, which include several pieces in a display case just off the main lobby as well as a room filled with glass artwork. Dale Chihuly is originally from Tacoma and still have an important presence in town, including the Bridge of Glass, located near the museum between Union Station and the Glass Museum. In 2012, TAM announced it was getting a gift of about 300 pieces of Western art from the Haub Family. To accommodate and display pieces from this collection, the museum essentially doubled its footprint and added an entirely new wing. The collection is worth checking out and rotates in new pieces periodically if you've seen it before. Tacoma Art Museum has been building its art collection since 1963, and today it contains more than 3,500 pieces of artwork total. All pieces are not on display at all times, but you can always view selections from the collection. The pieces span many time periods, cultures, and genres, including Japanese woodblock prints, European paintings, American artwork, as well as many Northwest artists and art forms. In addition to artwork the museum owns, you can also expect to see temporary special exhibitions during your visit. These can vary widely and include everything from Norman Rockwell (a prominent temporary exhibition from 2011) to an exhibit honoring fifteen years of Neddy Artists Fellows. Because of the constantly changing nature of these exhibitions, you can visit the museum throughout the year and always expect to see something new and interesting. There is a café inside the museum as well as a gift shop that sells a number of souvenirs, small pieces of art, artist books, and more. The museum also offers tours. The front desk can help you with these if you want to join on. Private tours are available for groups of ten or more, but must be reserved in advance. There are also cell-phone tours that start at the museum and tell you all about the artsy side of downtown Tacoma at the museum and beyond. The hours are Tuesday–Sunday from10 am–5 pm and free third Thursday from 5 pm–8 pm. There is an admission fee of ~$15 most days. There are discounts for students, military, seniors, and children. Members of the museum are free. If you can’t swing admission, don’t worry—there are a number of ways to see the museum for free as well. The most popular is perhaps the free Third Thursday, which coincides with Tacoma’s Art Walk. Between the hours of 5 and 8 p.m., all visitors are free. For Bank of America bankcard holders or employees, there is free admission on the first Saturday and Sunday of every month. Finally, if you have a Pierce County Library card, you can check out the Art Access Pass and get free admission for up to four people any day, any time. 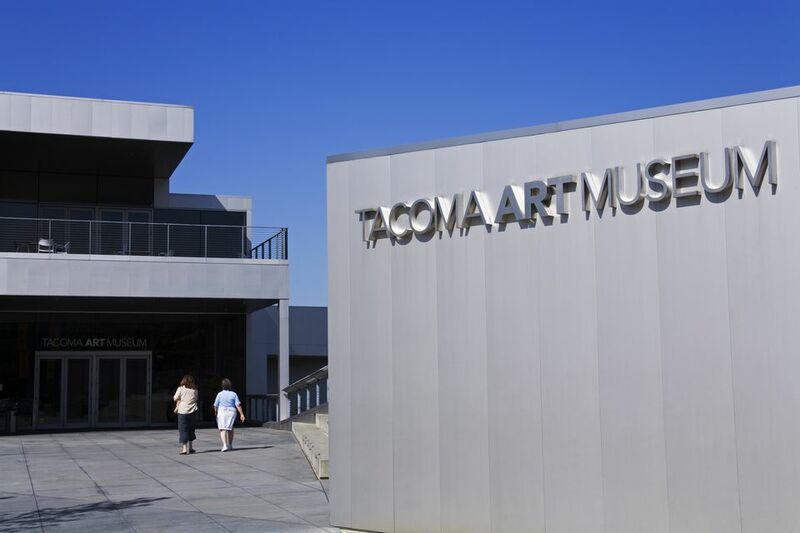 Tacoma Art Museum is located at 1701 Pacific Avenue, Tacoma, WA 98402. To get to the museum, take Exit 133 off of I-5. Follow signs to City Center and take the 21st Street exit. Turn left onto 21st and right onto Pacific. Take another right onto Hood Street (it’s a rather awkward angled street). Parking for the museum is the first right after this, under and behind the museum. There is a charge to park there. You can also park across the street right on Pacific avenue, which used to be free, but now has a minimal charge that you pay at a meter. Visiting this museum is a fine thing to do on its own, but because the museum is located in such close proximity to many other attractions, parking at the museum and wandering to check out the Washington State History Museum or some of the shops along Pacific Avenue can be a great day out. LeMay - America's Car Museum is also not far away and the Museum of Glass is just across the Bridge of Glass. Downtown Tacoma has some of the best restaurants and best happy hours if you want to make a date of it. It's also good to know that there are free museum days in Seattle and Tacoma.